After losing the “Sunshine” of her life, her four year old child, Jeane Temple, can find little to live for. Leaving everything in her life behind, she drives off on a journey of solitude into the barren California desert, where she witnesses a brutal murder. Running from the near deranged desert killers who are now chasing her, Jeanne faces her own survival and finds she has more to live for than she once believed. Donald Reiker has worked in television and motion pictures as a writer, producer and director with such artists as Steven Spielberg, Tom Hanks and Michael Keaton, among others. He produced and directed many of the episodes of the television series “Fame” which still airs throughout the world. He has written and directed the theatrical feature, ‘’Mona Must Die”, which is currently playing in Europe, Asia and South America. 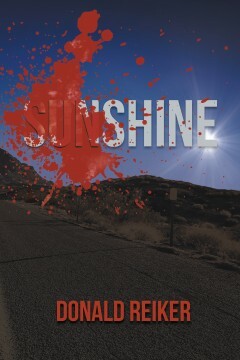 His first novel, ”Sunshine”, a thriller, is loosely based on the true story of his wife’s experiences.